From anywhere in the world, you can access your health care information and emergency documents online. 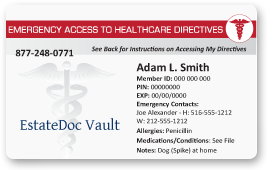 Should you require emergency care, the attending physician can instantly access your Health Care Directives, your primary care physician, and your health information (via your wallet card and PIN). Specifics about allergies, conditions, medication, and your emergency contact information are provided along with your Medical Directive. Hospital personnel will have access only to your health care information (only viewing and printing). Providing attending physicians access to your vital medical information can help prevent hospital errors which can occur when treating unfamiliar patients. Your documents speak for you when you cannot. Do you have a pet at home? This information can be included so your loved pet will not go for hours ~ possibly even days ~ without food or water if you are unable to return home as planned. 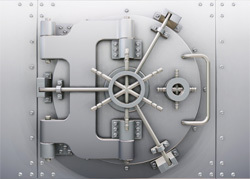 In addition to emergency access to Health Care Directives, EstateDoc Vault provides secure and private storage for your estate plan documents in our Vault. Your original documents will be available upon request to you or your representative, pursuant to your release and direction. Once a year you will receive a letter from us that reminds you to keep your important documents with us current with changes in next-of-kin, family, assets, and other information that can be critically important. Your Health Care Directives and estate documents are stored on-line on our secure platform and are backed up on an alternate secure server that is not co-located with our office. This not only gives you 24/7/365 on-line, global access to your documents, but makes it easier for you to work with your attorney, tax advisor, and other professionals. Your on-line documents are privately kept for only you, your attorney, and your personal representative, pursuant to your release and direction. This includes Post Mortem release to your representatives.